"We've discovered that our magnetic shield is drafty, like a house with a window stuck open during a storm," says Harald Frey of the University of California, Berkeley, lead author of a paper on this research published Dec. 4 in Nature. "The house deflects most of the storm, but the couch is ruined. Similarly, our magnetic shield takes the brunt of space storms, but some energy slips through its cracks, sometimes enough to cause problems with satellites, radio communication, and power systems." "The new knowledge that the cracks are open for long periods can be incorporated into our space weather forecasting computer models to more accurately predict how our space weather is influenced by violent events on the Sun," adds Tai Phan, also of UC Berkeley, co-author of the Nature paper. The solar wind is a fast-moving stream of electrically charged particles (electrons and ions) blown constantly from the Sun. 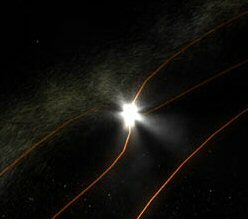 The wind can get gusty during violent solar events, like coronal mass ejections (CMEs), which can shoot a billion tons of electrified gas into space at millions of miles per hour. Earth's magnetosphere generally does a good job of deflecting the particles and snarled magnetic fields carried by CMEs. Even so, space storms and their vivid effects, like auroras which light up the sky over the polar regions with more than a hundred million watts of power, have long indicated that the shield was not impenetrable. In 1961, Jim Dungey of the Imperial College, United Kingdom, predicted that cracks might form in the magnetic shield when the solar wind contained a magnetic field that was oriented in the opposite direction to a portion of the Earth's field. In these regions, the two magnetic fields would interconnect through a process known as "magnetic reconnection," forming a crack in the shield through which the electrically charged particles of the solar wind could flow. 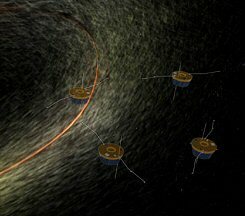 Left: An artist's rendition of magnetic reconnection. The amber-brown lines denote lines of magnetic force. The bright spot is where oppositely-directed fields are making contact and "reconnecting." In 1979, Goetz Paschmann of the Max Planck Institute for Extraterrestrial Physics in Germany detected the cracks using the International Sun Earth Explorer (ISEE) spacecraft. However, since this spacecraft only briefly passed through the cracks during its orbit, it was unknown if the cracks were temporary features or if they were stable for long periods. In the new observations, the Imager for Magnetopause to Aurora Global Exploration (IMAGE) satellite revealed an area almost the size of California in the arctic upper atmosphere where a 75-megawatt "proton aurora" flared for hours. A proton aurora is a form of Northern Lights caused by heavy solar ions striking Earth's upper atmosphere, causing it to emit ultraviolet light--invisible to the human eye but detectable by the Far Ultraviolet Imager on IMAGE. While this aurora was being recorded by IMAGE, the 4-satellite Cluster constellation flew far above IMAGE, directly through the crack, and detected solar wind ions streaming through it. This stream of solar wind ions bombarded our atmosphere in precisely the same region where IMAGE saw the proton aurora. The fact that IMAGE was able to view the proton aurora for more than 9 hours implies that the crack remained continuously open. Researchers estimate that the crack was twice the size of Earth at the boundary of our magnetic shield--about 38,000 miles (60,000 km) above the planet's surface. Since the magnetic field converges as it enters the Earth in the polar regions, the crack narrowed to about the size of California down near the upper atmosphere. Fortunately, these cracks don't expose Earth's surface to the solar wind. Our atmosphere protects us, even when our magnetic field doesn't. The effects of solar storms are felt mainly in the high upper atmosphere and the region of space around Earth where satellites orbit. Stay tuned later this week for a follow-up story from Science@NASA about how magnetic cracks have lately sparked beautiful auroras--a phenomenon of the upper atmosphere--in some unexpected places. IMAGE was launched March 25, 2000, to provide a global view of the space around Earth influenced by the Earth's magnetic field. 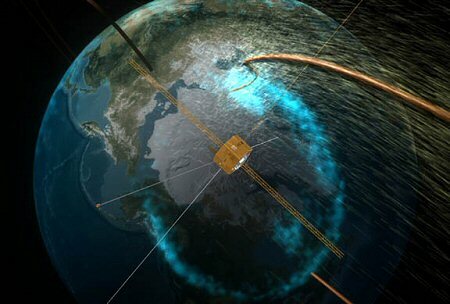 The Cluster satellites, built by ESA, and launched July 16, 2000, are making a three-dimensional map of the Earth's magnetic field. Click here for images, movies and more information. The Sun Goes Haywire -- (Science@NASA) Solar maximum is years past, yet the sun has been remarkably active lately. Is the sunspot cycle broken? Solar Superstorm -- (Science@NASA) Scientists are beginning to understand a historic solar storm in 1859.